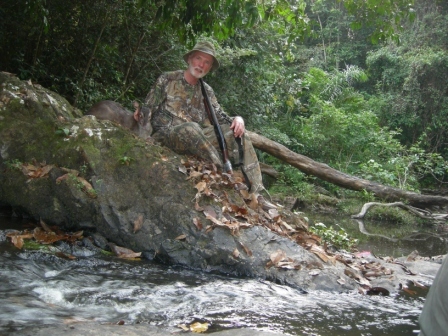 Weatherby Award Winner Ed Yates just returned from a 9-day hunt in Liberia with Morris Dougba's Liberia Rainforest Safari. Pictured is his first Zebra Duiker, a female. At the end of his safari (actually on day #7), he also shot a good male Zebra Duiker. Both Ed and his guide knew it was a hit, but saw it run away. They quickly confirmed several good-size splotches of blood, but could not find the Duiker even after searching for several hours. It took 2 days to organize a trained dog which quickly found the Zebra Duiker 50 yards from where it had been shot (the jungle is just that thick). Unfortunately Ed was on his way to the airport at the time, but he received a confirming phone call before his plane departed. Ed is only the third hunter to have shot 2 Zebra Duikers according to the SCI Online Record Book (the others being Dr. Jim Conklin and Hubert Thummler) and the first to do it in the last 27 years. Ed also shot an Ogilby Duiker, which the SCI Record Book says is "one of the least-known duikers." In fact, only 35 have been entered in the SCI Online Record Book and 4 of those were pick-ups. 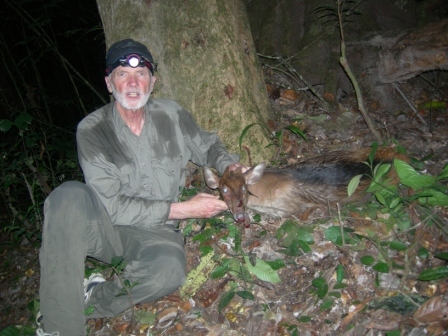 Ed also shot a Bay Duiker (above) and Maxwell Duiker (below), so he ended up taking 5 Duikers of 4 different species. 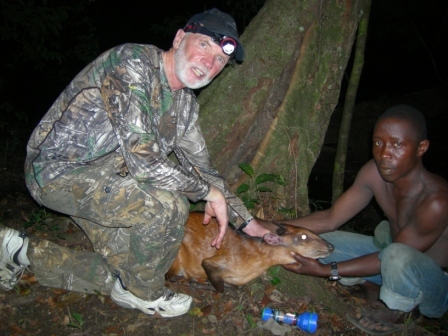 The 2013 - 2014 season for Liberia Rainforest Safari was from November 1 - April 30 with only 4 hunters during this first exploratory season in the newly opened Bella Forest. Already 11 hunters are booked for the 2015 season. That's right, the next season will not be a 2014 - 2015 season ... it will be January 1 - June 30, 2015 ... six months, but January - June instead of November - April. 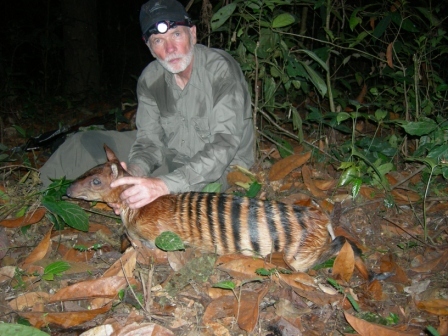 For this last season, Ken Wilson shot 4 Duikers, a Water Chevrotain and a Palm Civet in 7 days in December ... Craig Phillips and John Colglazier shot 5 Duikers between them in March ... and Ed Yates shot 5 Duikers in April. We currently have openings from mid-April, 2015 on and the price is only $9,900 for 7 days or $1,150 per day for 10 or more days. Call now to book.